I love audio books. IMO, a good reader can make a good book better, while a not-so-good reader can hurt a book. I always have an audio book in my car — and a half-dozen waiting on my iPod. The good and bad thing about listening to books, however, is when I find one that’s so compelling that I can’t “read” it fast enough. It doesn’t happen often, but I’m currently listening to The Queen of Bedlam by Robert McCammon, and it’s driving me crazy. I’m ready to take a road trip just to finish it. 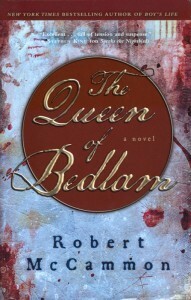 So, obviously The Queen of Bedlam falls into the outstanding “read” category. It’s the second book in McCammon’s Matthew Corbett series. The first in the series is Speaks the Nightbird — which I read twice, but The Queen of Bedlam is even better. McCammon is a master story teller, with intriguing and unique characters and intricate plots. Plus he’s a craftsman of the first degree. His use of language, the way he manipulates words, takes my breath away—and makes me a bit envious. Anyway, obviously, I’m loving this book, and I’m going to have to read the third one in print because I can read faster than I listen. So let me know if anyone else is a fan. I finished The Queen of Bedlam Christmas eve . . . I had to bring my iPod into the house and listen while I wrapped. I am blown away by McCammon’s skill . . . the way he puts words together. Okay, I know I’m blathering away.